By the end of World War II, Americans relationship with nature had changed dramatically. New consumption patterns drove an industrial economy that damaged the earth in new ways, and the atomic age heightened awareness of the earth s fragility. Environmental historian Steven Stoll identifies 1945 as the birth of American environmentalism - the point when conservation and nature advocacy fused with … activism to form a political movement. 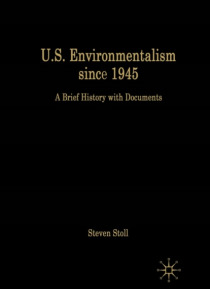 In this thematically organized collection of primary sources, Stoll traces the development of the environmental movement and identifies its central issues and ideologies, including the politics of preservation, population growth, biological interdependence, ecodefense, climate change, ethical consumption, and environmental justice. Stoll s insightful introduction provides students with a solid overview of environmentalism s origins and contextualizes the topics raised by the documents. Document headnotes, a chronology, questions for consideration, and a selected bibliography offer additional pedagogical support.